Preview Unified 3D Skin. Click Preview button to preview what your Unified Mesh will be from the following settings. Subdivisions Count. The SDiv slider will add subdivision levels to the unified skin when creating a skin from Zsphere Sketch mode. The setting max is 4 which will give 5 subdiv levels when an unified skin is created. The Skin Resolution slider determines the polygon resolution of the next skin created with the Make Unified Skin button. 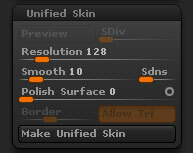 The Skin Smoothness slider determines the smoothness of the next skin created with the Make Unified Skin button. If this slider is set to 0, the 3D object is created using cubical skinning — the object appears to be composed of many tiny cubes. The Skin Density slider determines the density of the next skin created with the Make Unified Skin button. The Polish Surface slider will control the strength of Polish being applied to the ZSketch when Preview is pressed. The icon on the right will determine the polish mode that will be calculated. To change the polish mode click on the circle. Open Circle will apply a polish that will maintain the overall form of the ZSketch. Closed Circle will apply a polish that will smooth out the ZSketch without maintaining the volume. The Border slider will determine the number of borders around all ZSketch polygroups when Polish is active. Allow Border Triangles. When the Allow Tri button is pressed triangles will be allowed through out the Unified Skin when Preview or Unified Skin is pressed. Allow Tri will only become active when the Polish Surface slider is set pass 0. The Make Unified Skin button creates a new mesh by stretching a ‘skin’ around this object. The attributes of the skin are determined by the Skin Resolution, Skin Density, and Skin Smoothness items.